oh and you know what bb? i get recognized on the street more for playing in the blue rats than in any other band i played. so the exposure that blue rats has been avoiding is doing the exact opposite..hehe. introvoys,first circle,even playing in the kirat guy's band may have been exciting...but it wont hold a candle with playin in that goddamn band! I remember both Norman and Edmund fondly. Norman and I went back to '91 when the Breed and Advent Call played regular nights at Eddie Rocha's Fire and Rain on Pasay Road. We would teach each other bass lines, some of which I still use today. Whenever we do "Chain of Fools" I still get misty-eyed. Good old Norman... Never new a nicer guy. It was with Edmund that I experienced what may have been the pinnacle of my career as a rock bassist... 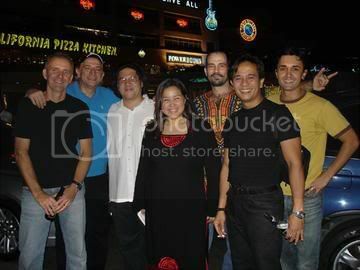 Playing for Pepe at Music Hall with Jun Lopito. I was onstage with all my contemporaries, and put there because they liked the way I held the low end down. Felt like I could've died happy right there. are you related to jollibee? Before going any further, just wanted to apologize for the length of this thread -- parang a bit self indulgent, pero since naumpisahan na, dapat na rin tapusin. i envy people who got to play with that man. ...And it was that idiosyncratic presence behind the kit that was essentially irreplaceable. So the band sought to "make up" for this by replacing Bosyo with........ EVEN MORE VOLUME. • Nino Mendoza (Blue Jean Junkies) jumping around, lying down, and taunting the audience in the mosh pit right before the Rats set at the Pulp Summer Slam. We weren't sure whether we were going to end up playing in the middle of a riot or what. • An Australian Navy frigate crew shows up at Hobbit and turns the the occupancy permit into a joke -- you couldn't get from the front door to the bathroom in 10 minutes. SRO, standing and dancing on the tables, fights, broken bottles every 3 minutes, the sweat of humanity. The bow placement master gunner was a woman the size of WWE's Big Show, and when the shirts started coming off, she ditched hers too and got up onstage to prance around in her bra. • Unsurprisingly, the loudest bunch of jammers sat in during this period -- Dixie Mabanta, Tirso Ripol, Mike Turner, and undoubtedly the loudest of them all.... Manny Amador. • Miguel's abject fear of doing the fast version of "Hey Bartender". • Epperson's stagefright -- hiding in the shadows of the biggest house speaker he could find at any gig. Not to mention the coining of the phrase "what key?" and "slowhead". • David pounding out a medley/freeform version of Zep's Rock'n'Roll/Whole Lotta Love/Moby [sausage] on the drums one night at Hobbit. • Johnny's mind and fingers wandering in the second set after the usual in-between-set visit to the car with Miguel and Cow. Also the coining of the phrase "Hoo boy... Hoo boy...". • Cowboy and the demands of "the women" in his life. • Tricie finally finds the gumption to hold the microphone.... getting over her fear of touching it like it was a p***s.
• Joe's chronic case of "the bad jack" syndrome on his reverb pedal. Ouch. • Great gigs at Republic of Malate and Sanctum. • Great backup vocals from Tebbet Gomez, Tricie's sis. • The BIG ROMANCE..... Tricie and Miguel get together. • Other predictable romances.... Apa's #6 and #7.
wow....i always thought i was missing a lot when i left blue rats...but i never expected it to be like that! Personal memory... I remember Louie (my daughter, now ten) was only a couple of years old and in the hospital for what the doctors thought may have been Dengue (thankfully it wasn't but they still can't tell me what the f__k it was). 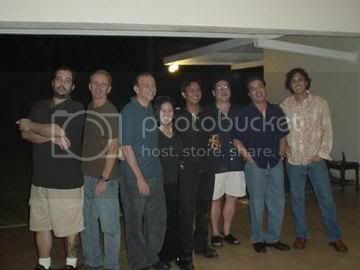 The first "talong" party was that night, I think... Or was it that gymnasium gig in Antipolo? Anyway, BB graciously offered to pick me up from the hospital and to drop me off afterward. I was greatful for the diversion, after having to forcibly hold Louie down so the doctors and nurses could stick needles into her for her i.v., blood tests and all that. Boy, was I a mess. Thank God for music. • The hot japanese guitar player who did "Texas Flood" with us .... "oooh it's froodin' down in texas.... arr the terephone rines are down..."
Well,well... welcome here buddy. It's been a while. We miss you bigtime. Funny how this thread's becoming a magnet. We have b2d to thank for that... see what you missed? Can't believe you remembered Toshi's name Migs. In retrospect, in someways he would have been a difficult character to forget -- I can still hear him singing. Hurry back with Trice and tie the knot -- can't wait to jam with you guys again. well, the band has been around for 10 years and its past and current lineup (and the people who sat in with the band) is sort of a who's who of the pinoy blues scene. may k.
there is no blue rats website,no friendster account,not even myspace. just to clarify, we do have a yahoogroup which i started some years ago. join up @ http://launch.groups.yahoo.com/group/thebluerats/ sali na! • Missed Financial Opportunity: The failure to invest in stocks of pharmaceutical companies that manufacture anti-inflammatory drugs. During these middle years, 3 Rats made those companies rich because they were afflicted with gout -- Bosyo, Norman, and me. Though not in the middle years, my body was also a gout breeding ground!!! Migs!!! Welcome to the thread, 'adre. While I'm at it, allow me to say that though I've had many, many good times with the Rats, some of my favorites were when we got you... Pool at Rack 'n' Roll, engaging in (ahem) extra-legal activities between sets (hence my "Second-Set Johnny" monicker) and just hangin' around shooting the breeze. Can't wait to see you and your better half again... Though I have to warn you, "second set" is something I've left behind... I reserve that for days when I don't have to concentrate on anything. Getting old, 'adre. See you guys soon. That pic was taken at Kid Creole a couple of years back during my "black period" (naks). Of course that was with the Rats. Andy Maluche (tama ba spelling?) took that one. He's got a whole series of the Rats, at that time calling himself the "official court photographer" of the Rats. I didn't like the way he got in our faces to shoot without warning us, though... But then again, maybe they wouldn't have turned out so nice if he did. o ayan pag uwi na nila mr and mrs. o____ sa pinas...cguradong magkakaroon na ng blue rats reunion. hope you guys can wait for me.i might come home next year. black period dyani? it seems to me all your life you've been wearing black. or were you referring to something else? and dyani...i was there when we dropped you off sa hospital. you looked pretty cool even if you had a lot of things on your mind. ako personally, laking kilig na makasama ko sa banda noon ang bassist and drummer ng breed at razorback. feeling ko magaling na din ako. Nate, as usual, you are a gracious and generous gentleman. Not surprising that you and Delta are good friends -- two of the nicest folks on these here forums. Thanks. Dinner: Kare-kare, bagoong and repolyo. bb - who said nathan and i are "good friends"? we're "just friends" noh! bb, this is also what i meant about you guys being the true consummate professionals in the blues scene. working hard for 10 years through good and bad. that's really admirable and amazing. it would be great to keep a band for 10 years, but to keep it at the level of musicianship you guys play at, that just blows my mind... of course, as long as it continues to be fun, the show goes on. I think the whole charm of the Blue Rats is, as BB oftentimes puts it, how we never play the same tune the same way twice. Why is that? Well partly because we never used to rehearse the way we do now, so every night was a complete surprise, even to us! The other reason is a lineup that almost never remains the same, so it's like having a different band every year! Even now, with a relatively more stable lineup the sound will change depending on who's available (or absent) for the evening. Take last Thursday at Dish, for example... We were down one singer (Kim) and a guitarist (Cowboy). If they had been there that evening you would have heard a completely different band! Whoever says that the blues is boring has never seen us play. We look forward to your full line-up at Mag:net! That's if you can all fit on stage, hehe... You are one amazing group of musicians! its like i was there! wait... I was!! I think the whole charm of the Blue Rats is, as BB oftentimes puts it, how we never play the same tune the same way twice. Why is that? The real answer: "Because we always screw up.... and it's always in different parts of the song!". But seriously, you guys are too kind. Objectively, I think every version of the Rats had its weaknesses as well as its strengths. But one particular aspect has held through every phase -- the ability to talk things through and resolve issues pretty squarely. The formula is just really simple: make room for everyone else, don't get too uptight, never assume that you know it all, and just have fun. 'Yan lang naman e.
As the new millenium unfolded, the band found itself with a nice ratio of younger folks to old goats -- about 50:50. Tricie, Cow, Miguel, and David on one side, and Tom, Joe, Johnny, and A.L. on the other. Good balance, good chemistry (for some guys, literally ) But as for millions of our kababayans, the lure of going overseas soon became real for most of the younger Rats. The first go was Dave. As he prepared to wrap up his affairs at home -- including the obligatory despedidas with the Rats, the remnants of Razorback and Wolfgang -- the band had to find a replacement gunslinger to fill the rotation. Enter the the dude with the quickest draw, biggest bullets, and the some of the shiniest pistols in town..... Joey Puyat. As part of the Mexicali Blues Band, Joey was familiar to everyone in the band as both bands had played alongside the other in several venues in the mid 90's. He was one of those legendary figures (ex-Mother Earth, etc.) who played with just about everybody of note from the mid 70's onward in the diverse fields of jazz, fusion, blues, and pinoy rock. In short, the guy could (and still can) play anything outstandingly well, and playing alongside the guy was either: 1. a free guitar lesson, or 2. a jaw-dropping excercise in confusion/wonder/amazement in trying to guess which bodily orifice he had just pulled that solo out of. In short order, he was baptized into the "order of the rodent" and suddenly, it became really important who played what kind of guitar or amp so that solos could clearly be heard above the wall of sound. Thus began the Rats' "era of the tonehound". • Miguel, Johnny, and Cow started laying the groundwork for various bands -- "The Experiment", DRT, and GipsySuns. • Joe became more deeply involved in his church. • Joey played out at various guitar events/festivals and talking of Mother Earth reunions. • Tom began sitting in on gigs around town, most notably with the newly invigorated Wally Gonzales Bluesband. • Tricie worked on a demo to bring with her Downunder. • The re-birth of the 80's band Overdrive: first public gig in almost 20 years was one set back to back with the Rats at A.L's outrageous surprise 40th b-day celebration at Hobbit -- probably 150 people all wearing AL "masks". Masterminded by Apa -- then I think just starting on #8. • Fun all-acoustic gigs at Sanctum with Miguel bumming out and killing his fingers on the K-hon. "The Rolling Stones Guy" showing showing up dressed like Keef in leather pants and his navel showing under a mid-riff and blazer combination. • The first Earth Day concert at The Beacon School. Instant Rockstar status. Easily the school's favorite local band. • The Jaguar Cars Launch at the Peninsula Hotel Ballroom. The band had to learn the Jaguar ad campaign song "A Little Bit of History Repeating" by Shirley Bassey with the Propellerheads. Scared the living s**t out of the matronas in the front row. Saw a few with their fingers in their ears. • Tricie's incredible farewell gig at Republic of Malate. Loud and Proud. Anyone have any pics of that? Bad Behavior has blocked 43819 access attempts in the last 7 days. Page created in 1.448 seconds with 24 queries.